It seems like an old dream when running a successful business had nothing to do with creating unique hashtags, or making funny memes, or sending tweeting birds everywhere, and… well, you get the point, right? In today’s day and time, you don’t want to be running a bakery while missing out on Valentine’s Day, or Chocolate Day, or even something as vague as Engineer’s Day! Maybe the last one took it a little too far, but social media is absolutely not something you can ignore. And just so you don’t ever miss out on vague or not-too-vague ‘days’, or forget to tell people about the new cake you’re launching, this is what all social media marketing companies in India will suggest you make – a social media calendar. Which platforms are planning to use, or already using? Which of these is really working out for you? Is there any platform you think you should quit? Any imposter accounts you need to be worried about? Do you have platform-specific goals, or just one broad aim for all – like, increasing visibility? These are the questions, answers to which will help you take stock of the efforts you’ve been currently been putting towards social media planning. If you’re working with a team of other people, then you also need to have specific people who take clear responsibility pertaining to each social media network. Not to mention, all this information will directly affect how you plan your future social media calendar. Now we arrive at the content part. Take a hard look at what exactly you plan to post. How much of it is still relevant, and how much deserves to be scrapped? Are you also observing and analyzing how your competitors are using social media? The publishing schedule you’re going to set from here will include the answers to all these questions. You can’t always post the same thing to every platform. If your Facebook audience is a little older than your Instagram followers, they might not get some of your memes or GIFs. The best times for Facebook marketing are Wednesday and Thursday, between noon and 2 pm. On the other hand, Saturdays turn out to be the least engaging. For Instagram, while it’s safe to post between 9 am and 6 pm, anywhere from Tuesday to Friday, Sunday sees the least engagement in the week. Twitter is good for posting on all days, right from 10 am to 12 pm. But, Sunday mornings can be challenging, so you can drop them from your calendar altogether. LinkedIn sees a variation in engagement all week, every week. Wednesday, from 3 to 5 in the evening is the best time to post; although Tuesday to Thursday is all fine. Starting Friday through Monday, it turns out, LinkedIn does not see much user engagement. As you look at the above-mentioned statistics, you’ll see that the frequency of posting on each platform also varies. Your Facebook advertising would differ from Snapchat marketing, or just like you could have considerably more posts published on Twitter, than say, LinkedIn, on a weekly basis. Therefore, looking at the audience demographic, their taste, the time they spend on a particular platform, are some of the factors you’ll need to consider before shaping your content and deciding on day or time slot when you’ll post it. Every day you post, you should have a storage or a repository of content from where you only have to choose the content that can fit the post of the day. You can’t always have time on your hands to design a post every single day. Unless it’s a breaking news of some kind, you should have an excel sheet or any kind of database of content, a fully organized one, that you can simply copy and paste on your calendar. As for any calendar, the organization is the key! When it comes to social media optimization, it is organization matters the most. Have a bookmarking system, where you create categories like – ‘blogs’, ‘announcements’, ‘videos’, ‘Motivational Monday’, etc. Store your content under such categories; but, more importantly, have these tags go right on your calendar so that you don’t have to rummage through your whole content repository just before posting time, and post whatever looks good. A ‘Motivational Monday’ post might not suffice for a ‘Throwback Thursday’ post. Or, the time on calendar reserved for blog posting shouldn’t have a funny GIF posted instead. 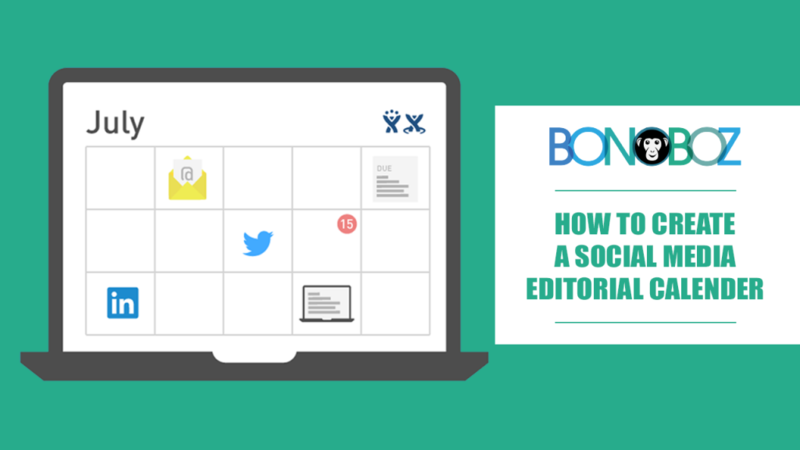 And finally, you should use one of the many tools like Buffer, Hootsuite, SocialPilot, and such to schedule your content for publishing. This will further save you a truckload of time and energy! Bonoboz is a leading social media marketing company, that has years of experience providing social media marketing services in India to clients belonging to various industries. We absolutely look forward to helping your brand get more Internet exposure and a greater visibility before its audience. For any questions, you can give us a ring at +91 8128661015, or write us at contactus@bonoboz.in. Like us on Facebook Stay connected with the latest from digital marketing & growth! Like what you read? We’ll send our blog posts right to your inbox.